An important part of the big day for a bride is to have the perfect wedding gown... A visit to the boutique Wedding Room Sposa in Ventimiglia is guaranteed to be the beginning of a very beautiful and happy journey. Antonella Pastore is the boutique owner and together with her daughter Valentina Biancheri these two women will introduce the future bride to a collection of exquisite gowns. The showroom is full of elegant designs to suit every bride and every style of wedding. "We are talking chic, we are talking class, we are talking la crème de la crème." Designer wedding dresses and elegant atire has been part of a long-standing family tradition. Their knowledge and passion for chic style and achieveing that quintessential look is shared with their future brides. Every woman, from the moment she arrives in the boutique, is masterfully taken care of in order to create that magical experience that every bride dreams of. Antonella first opened her boutique as Liolà in 2006 specialising in outfits and accessories for ceremonies and occasions but her dream was to create a unique wedding shop and so in December 2010, the Wedding Room Sposa was born. "I love working with happy people who share their wedding dreams with me" says Antonella. The philosophy behind the wedding boutique was more in keeping with her daughter's vision. Using their professionalism and attention to detail, Antonella and Valentina are able to meet the demands of all brides and turn dreams into reality on their most beautiful day. Choosing designs for the boutique can be a challenge and so the goal is always to display a wide collection of gowns that are original and unique to suit all styles and trends. In order to give every bride that special attention, Antonella and Valentina work by appointment. From the moment the bride arrives at the boutique, she is greeted to a warm, comfortable and fragrant environment with soft music in the background. This relaxed setting is perfect for Antonella to learn as much as possible about the bride, her wedding day and how the occasion will flow. "And then the exciting part," says Antonella "is to fulfill the bride's wishes and find that perfect wedding gown... the dress of her dreams." 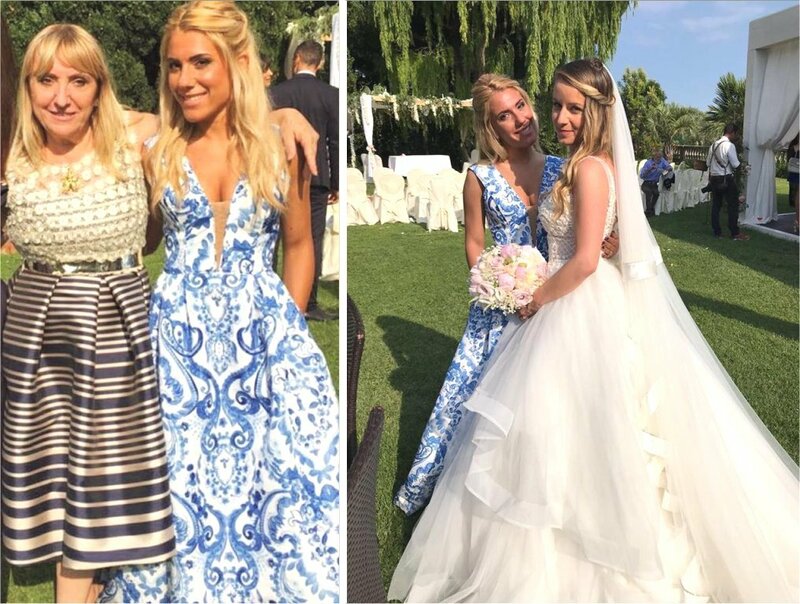 Antonella and Valentina are also available to attend the big day to ensure that the bride is looking absolutely radiant for her ceremony.